May 20, 2015 - Aerion Corporation's board of directors has authorized the sale of the AS2 aircraft at a price of $120 million in 2015 dollars. The initial 50 launch customers will receive preferential pricing and other benefits available only for this first tranche of orders. 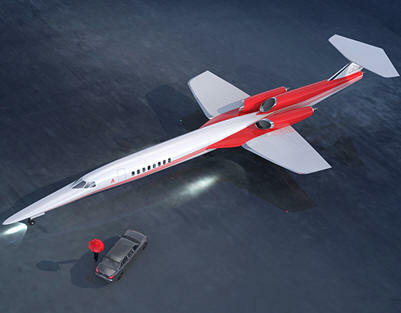 "This is another step forward for Aerion," noted Aerion Chairman Robert M. Bass. "We are offering a select group of forward thinking business aviation users the opportunity to fly faster and to make history with us as we reintroduce commercial supersonic flight." Aerion also announced that Ernest (Ernie) Edwards, formerly president of Embraer Executive Jets, had joined the company as senior vice president and chief commercial officer. "We will be having some very interesting discussions with travelers who place a high value on their time," he said. "They can save three hours between Paris and Washington, D.C., and six and a half hours between San Francisco and Singapore. That speed advantage will be quite meaningful to them." The company continues to expand its engineering organization and deepen ties with Airbus Group as the two entities participate in a joint definition phase, refining the AS2 design. Aerion moved into new and expanded offices in Reno, Nevada in March to accommodate a growing staff and provide space for Aerion and Airbus engineers to work together. New low-speed wind tunnel tests are planned for the AS2. They will take place at the University of Washington wind tunnel complex in September. "We've made substantial progress in defining the AS2 from the inside and the outside, said CEO Doug Nichols. "It clearly is the shape of things to come and the next great advance in civil aviation." Aerion Corporation is an American aerospace firm founded by Robert Bass and based in Reno, Nevada. The company was formed in 2002 to introduce a new era of practical and efficient supersonic flight. Over more than a decade, Aerion has demonstrated advanced wing technology in conjunction with NASA and other leading aeronautical institutions. This research includes breakthrough work in the area of supersonic natural laminar flow, the key enabling technology behind the company's AS2 business jet.